By Frederick Feraco Located in Huntington Station, NY, the Walt Whitman High School science research program is for 9-12 grade students interested in research. This program provides students with opportunities to further develop their independent science research skills through a year-long project in science, math, or technology. Chris Sullivan, Manager at Fishlife Aquarium, is carefully instructing students how to frag coral. Photo by Frederick Feraco. The research class meets for one period every day for a full year. The progress of each student is evaluated by successful completion of the course requirements which include the completion of a major science project. The progress of each student is evaluated by successful completion of the course requirements with an emphasis on research design, writing and presentation skills. Participants in the course are encouraged to continue in the research program throughout their high school career. History In 2016, Walt Whitman High School revamped their science research program. Science research teacher Frederick Feraco wanted to excite and bring science research in the classroom to the next level. Joe Racioppi and Paul Olsen from Fishlife Aquarium in South Huntington, discussed the idea of building a theoretical coral aquaculture system that could be the center of the research program. The School supported the idea. The system was donated to the School by Fishlife in an agreement to make it part of student research, and that students would get a real sense of research in partnerships with experts, scientists, enthusiasts and professionals. Donations, sponsors and grants for research programs are also vital to the development of a system as elaborate as this coral aquaculture system. A glimpse of the water change system set along the back of the frag tank. Photo by Frederick Feraco. Increase hands on research opportunities through student involvement installing and maintaining basic functions of the coral aquaculture system. Create a student management team for the project aligned with the student’s particular interests or education goals. Students will be organized into a functioning team that will not only support the fundamentals of maintaining healthy coral aquaculture systems, but also provide students with real world team building and interpersonal skills needed to be successful in today’s professional workplace. Compete in high level High School research competitions with outcomes from coral aquaculture research. 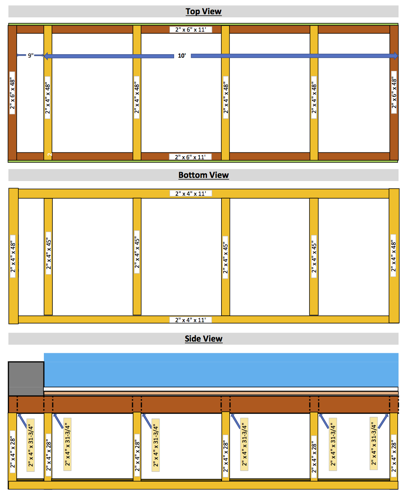 The original frame design by Paul Olson showing the dimensions of the stand before the build. Photo by Frederick Feraco. The design of this system and the theories around the functionality became the drive and excitement to install this for student exploration. Paul Olsen from Fishlife Aquarium first sent me these designs. Paul and Joe are super passionate about aquaculture and student research. They then explained in detail how the system should work. 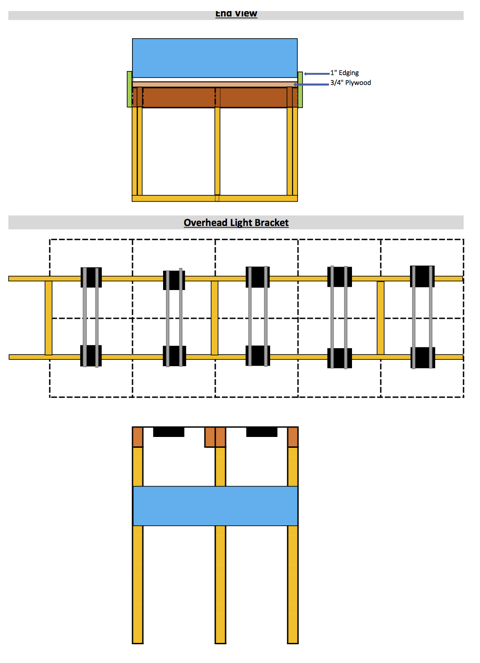 The original lighting bracket design for all 10 ecotech radion lights above the frag system. Photo by Frederick Feraco. 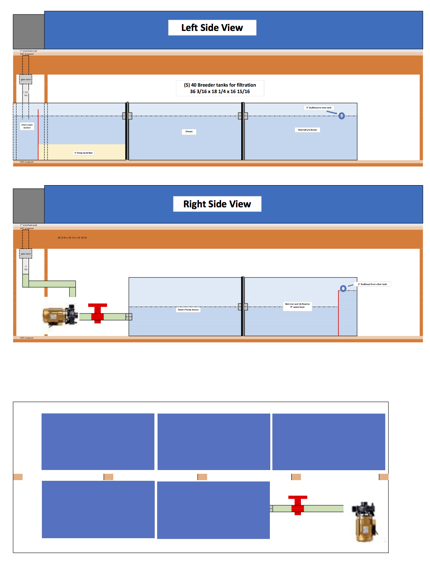 Here is a brief overview of the filtration system I designed for the frag tank. Each part plays an important role and must be in a particular order. 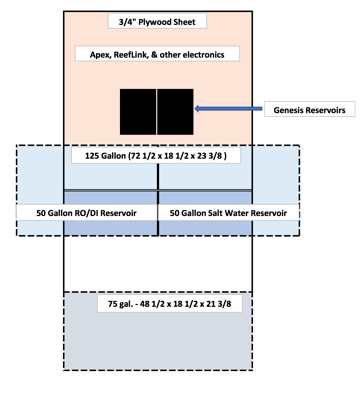 Generally, the filtration system is set up for water to flow from the aquarium to the Deep Sand Bed, to the Chaeto (Chaetomorpha algae), to the Live Rock, to the Protein Skimmer, to the Calcium Reactor, and finally to the Return Pump which sends the filtered water back to the aquarium. It is important to note that the information available to the public is generally provided by manufacturers of equipment for sale to the hobby therefore profit motivated. There are a small percentage of truly dedicated people who take a science based interest in the hobby and can be considered reliable sources. There is an abundance of choices for equipment and most work very well. This system is based on my personal 4-year research project, along with my lifetime experience as a hobbyist for my own “ideal” system. Deep Sand Bed This component is very controversial in the reef-keeping hobby. The clear majority of people use filter socks and/or sponges to mechanically filter out the largest pieces of debris and waste. The deep sand bed (DSB) does this and more. Most people rely on the many myths and inaccurate information available about DSB’s. The principle is based on what occurs naturally in the ocean. All reefs are surrounded by DSB’s. Solid waste from fish, corals, and other sources end up being carried by water flow away from the reef and end up settling on the ocean floor (DSB). There, millions of life forms from microscopic to small critters inhabit the DSB. Aerobic organisms live near the top, and anaerobic organisms live deeper in the sand. They all play a part in processing the waste; generally, the waste is their food source. Dissolved organic waste is removed from the water by other means (Protein Skimmer/live rock). In order for a deep sand bed to be effective in an aquarium it must have a minimum of 4″ of depth, preferably closer to 6″. It must also have a steady, gentle flow so that the solid waste can “settle” onto the sand bed. It should not have any burrowing or sand shifting animals which would disturb the structure of the DSB. There are numerous advantages to using the DSB. They are self-sustaining, that is the populations increase and decrease according to the supply of solid wastes and don’t require maintenance; they remove the human risk of failing to regularly clean and replace filter socks and sponges; they provide additional food sources to the reef inhabitants (the critters that process the solid wastes also serve as food for corals, fish, and other reef inhabitants. 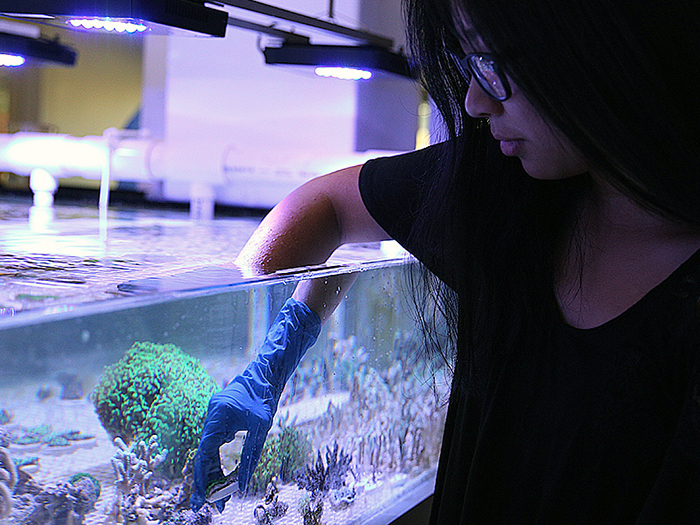 Walt Whitman High School student Jasmine Thai carefully arranging coral frags by species to start group lighting schedules for optimal growth. Photo by Frederick Feraco. Chaeto Chaetomorpha algae is a form of macro algae (traditional looking plants) vs. micro algae (one celled plants that cover everything in the aquarium and are a nuisance). It is placed into the filtration system to outcompete micro algae for nutrients consumed by algae. Chaeto is selected because it is extremely effective at consuming nitrates and phosphates which are removed from the aquarium when one harvests the excess growth of the chaeto and also because its growth can be easily controlled due to the fact that it doesn’t send out roots, runners or other means of spreading (it grows floating in the water and can simply be trimmed back when necessary). A front view of the aquaculture system showing the overflow box and on the far side the elaborate electronic panel. Photo by Frederick Feraco. The initial design for the 5 chamber sump system. Photo by Frederick Feraco. 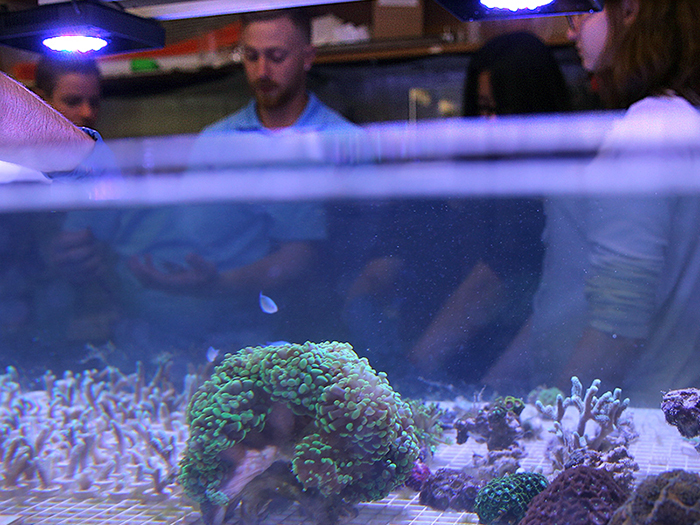 There are two pieces of equipment that are critical to growing corals (or a reef tank). It is next to impossible to be successful with corals without having the proper lighting and a good quality, effective protein skimmer. The protein skimmer replicates what one would observe walking along the beach and seeing foam on the sand where the water meets it. Also, when one sees the foaming on the crests of waves, this is part of the process. Without going too deep into the technicalities, a protein skimmer injects tremendous amounts of air and turbulence into a chamber where micro bubbles are formed. An electrical charge on the surface of the air bubbles attracts the opposite charged dissolved organics in the water and then the air bubbles carry the dissolved organics up to the surface where it is pushed up a narrow neck and falls into a collection cup where the maintenance guy (you) empties the cup down the drain, thus removing dissolved organics from the aquarium. Paul Olson the engineer and architect behind the design carefully monitoring his baby coral frags. Photo by Frederick Feraco. 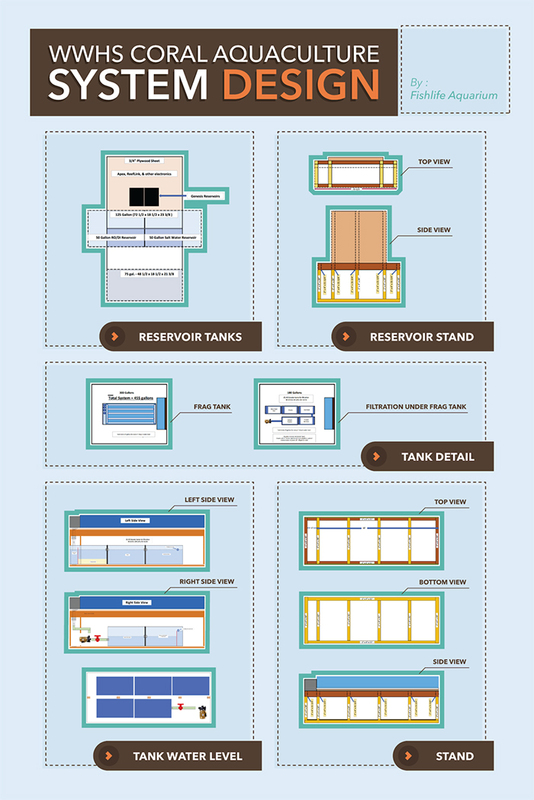 The front view design for the auto water change system located at the end of the tank. Photo by Frederick Feraco. A front view of the silent fail safe overflow system and powerful hammerhead return pump next to the CO2 tank for the calcium reactor. Photo by Frederick Feraco. A front view of the neptunes apex system, Genesis renew and storm ATO system and elaborate wiring for the lighting. Photo by Frederick Feraco. This is an obvious part of the filtration system; that is, once the water is filtered it must be returned to the aquarium to start the process over again. However, there are also important considerations in selecting the right pump. In our case, we are using a very powerful pump with very high head pressure in order to produce maximum flow within the aquarium without creating too much turbulence. Any pump could be used that is capable of simply getting filtered water from the sump back to the aquarium, which is what most people do. But then they must install multiple circulation pumps inside the aquarium to get the necessary flow for healthy corals and waste extraction. I have designed this system so that five rows of PVC pipe will line the bottom of the aquarium with each having ¼” holes drilled on both sides every one inch or so. This will create many, many small jets of water circulating within the tank instead of one or two large spouts of water coming back to the tank. 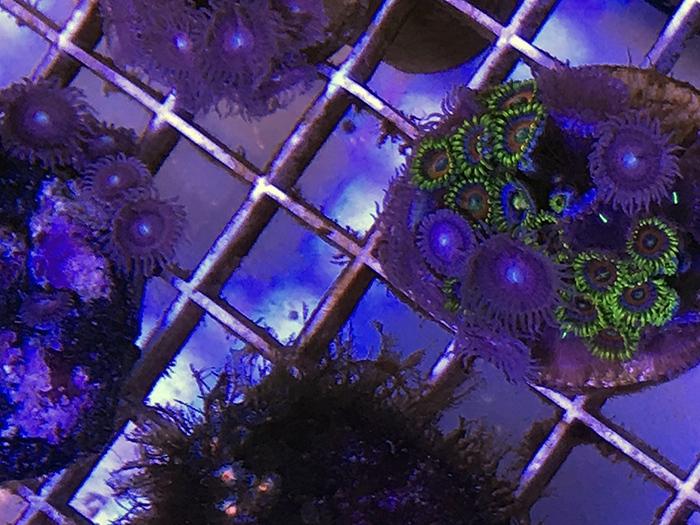 A top view of a few soft corals frags. Photo by Frederick Feraco. The system started up over the summer of 2017. We have LPS, SPS and zoanthid species growing. We have learned something new every day we have been in contact with the system and life in the system. Students have been investigating various topics. A break down of the volume of the system. Photo by Frederick Feraco. Developing an inexpensive time lapse photography system with micro computers to monitor coral over time. Developing machine learning algorithm to determine accurate reading of water parameters. Monitoring SPS, LPS and zoanthid growth using image processing. Determining most efficient method for eradicating Aiptasia. Developing systems for rotifer growth. Monitoring Polyp behavior during day and night cycles. So far, I’m very happy with the results of this project and can see the tangible benefits for my students on a daily basis.